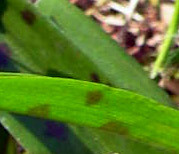 The leaves of this orchid are dark green, and have purple black blotches on them. 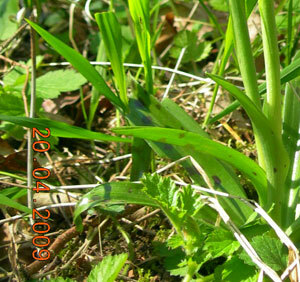 The leaves are narrow, linear with parallel venation - they are undivided and untoothed. The leaves margin is entire. Leaf length is 5 - 10 cm, and width about 2 - 3 cm. They are arranged in a rosette around the stem. The stem is erect , solid and fleshy. 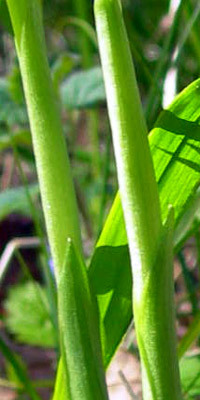 There are some 6 - 20 flowers born at the top of the fleshy stem. The flowers are various shades of purple, but sometimes pinkish verging towards white - with a somewhat unpleasant smell (smell of tom cat!) - especially at night. Flowers of orchids are very variable in shape and form BUT the flower is always two 'lipped'. Orchids are monocotyledonous plants - so apart from having parallel venation to their leaves, the floral parts of monocotyledons are often in threes or multiples thereof. 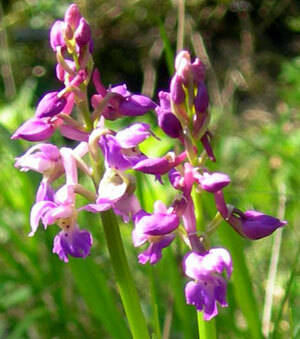 In the early purple orchid, there are three sepals. Petals and one sepal form the 'hood' or helmet of the flower, the two other sepals are erect and back against each other. The lower petal or lip is slightly lobed and has purple brown spots. There is a spur behind the flower, which is upward curving and stout. The stamens and stigmas are joined are joined in a central column. 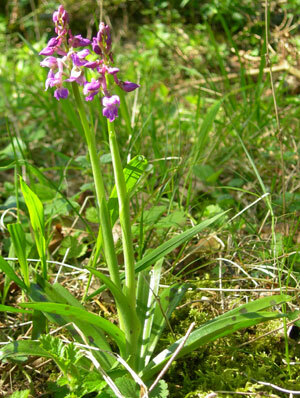 The early purple orchid (Orchis mascula)is to be found in woodlands, hedgerows and in grassland, and is tolerant of sun and shade. Its root system is formed from two tubers, that may be rounded or ellipsoid. In the past, the roots / tubers were sometimes used to make a 'flour' called salep : the Romans were quite keen on making various drinks from orchid tubers - some of which were considered to have aphrodisiac properties! The tubers are known to be rich in a complex carbohydrate (a polysaccharide) known as glucomannan. Thanks to Dan (of woodlands.co.uk) for images.